The Festival Hall is a versatile, multi-purpose venue, suitable for all kinds of events. Perfect for all music, drama and dance performances, it’s also an ideal choice for exhibitions, fairs, business meetings, corporate functions, dinner-dances and galas. 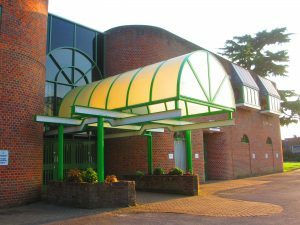 The Festival Hall is located in the heart of Petersfield, next door to the Town Hall and with ample pay-and-display car-parking nearby. Easily accessible by road and rail from London, Hampshire and the South of England, it offers flexible space and superb facilities – the perfect setting, whatever the occasion. Visit the The Festival Hall website! For up-to-date information on the events being held at the Festival Hall or any other information regarding The Festival Hall and Rose Room please visit the following link www.thefestivalhall.co.uk/whats-on. How the Festival Hall Came About? The Petersfield Musical Festival was founded in 1901 and took place every March in the Drill Hall which was converted for army use from a large maltings in Dragon Street. In spite of short-comings as a concert hall the ‘Festival’ used it for nigh on 30 years. Always in the air was the idea of a purpose built hall to house the ‘Festival’, until in 1933 a public meeting was held of everybody interested in leisure facilities in Petersfield and the surrounding area, and a committee was formed. Mr A J C Mackarness who was a Petersfield Solicitor and Chairman of the Musical Festival became its Treasurer. Dr Harry Roberts served as Secretary and the Chairman was Alan Lubbock later Sir Alan Lubbock, Chairman of Hampshire County Council. At this time the Petersfield Urban District Council had purchased land at Pound Meadow with a view to building its headquarters and was suitably impressed with the activities of the ad hoc committee. It entered into an agreement with the committee that a new concert hall would be added to the project, the financial basis being that the U.D.C would pay for the offices and what was a small ‘Parish Hall’ and the Committee would raise the necessary finance for what was for many years called the Large Hall (now called the Festival Hall). The Small Hall is now converted into offices at the S.E. part of the Town Hall. The Festival Hall portrait of Dr. Harry Roberts was unveiled by Sir Adrian Boult during the interval of Petersfield Orchestra Saturday afternoon concert during the late 1949. The concert was given under the baton of Kathleen Merritt. In February 1969 Kenneth Hick, then Urban District Councillor for four years, suggested that £200 per year be budgeted for stage improvements. This was agreed too and five year’s allocation eventually being spent on improvements to the overhead grid, this initiated the process of improvements to the Large Hall as it was then called. The naming of the Festival Hall celebrates the upgrading of facilities in 1979. This consisted of the provision of tiered seating and the construction of three new dressing rooms along the back of the stage. Prior to this, out of viewing crossing to the other side of the stage meant having to go outside, in all weathers and some cast dressing used the small hall rooms by the sound pod on the stage right hand wall of the auditorium. The pod was included in the ’79 improvements. Also re-vamped at the time were the Town Hall ground floor toilets. One further improvement was the provision of a rear – stage piano store shaped to accommodate the Festival Grand Piano. The driving force behind this major project was Kenneth Hick and the result of four years planning and consultation. The Rose Room was constructed, the rear-stage area was enlarged and re-vamped, a scenery dock was built together with the Green Room and the orchestra pit/apron stage life area constructed. With the advent of the lifts it became possible to store the concert grand piano at floor level and the piano store/chair store added to the project. A further pod for lighting control was added to the stage left wall. In many ways perhaps the most significant improvement was a new foyer entrance to the hall which also provided further public toilets and access facilities for disabled people enabling them to take a full part in the activities at the Festival Hall. The architect for this and the 1979 improvements was Kenneth Claxton. G.F.Eade & Son (Petersfield) and Braziers of Southampton were the respective contractors. The story is one of continuous improvement throughout its life, which could only take place with the support of the people of the Town of Petersfield.